You will learn the 7 Steps To Role-Play Success. You will see two example role-play exercises. You’ll find a video that shows you what employers want to see during your role-play. You can listen to our podcast on role-play success here. You can practise role-plays and learn a proven framework to pass ANY role-play in our Role-Play Masterclass. You can get hold of a full suite of interview preparation tools here. Let’s get started. So what is a role-play exercise? A role-play exercise is an assessment activity in which candidates act out an imaginary scenario that closely mirrors a situation that could occur in the job they have applied for. What happens during a role-play exercise? 1) You will be given a briefing document that outlines the scenario and your objectives and will be given 20-30 minutes to prepare. 3) At the end of the exercise you will be scored on your performance and that feedback will be factored in to the cumulative results of the interview/assessment centre. Obviously the context of your role-play brief will vary according to your industry, but the skeleton structure of role-plays tends to remain the same. Before we look at a real-world example and move on to the ‘7 Steps To Role-Play Success’ let’s take a moment to get an employer’s view. What do employers want to see during a role-play exercise? To give you a clearer idea of what to expect let’s now look at 2 real-world examples. “You are a team member. The other role player is your manager. You have worked for this company for 4 years, having worked for your Manager for the last 2 years. 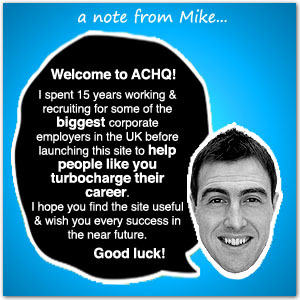 The work is very enjoyable however you get very little development time from the boss, and you are very keen to get on. The manager does the annual appraisal every February with you. Lots of promises are made, however nothing seems to get done. There’s always an excuse. Samantha, who does a similar job for a different boss, always seems to get plenty of time with him – reviewing performance, action planning, different projects, extra responsibility. She’s even spent some time in another part of the organisation for a couple of weeks on secondment. These are very simple examples of two of the most common role-play scenarios. For highly-detailed practice role-plays and to learn elite role-play techniques you should take a look at the Role-Play Masterclass. Ok, so we know what a roleplay is and what employers want to see during the exercise. We’ve also seen some real-world briefs, so now it’s time to get into the nitty gritty. 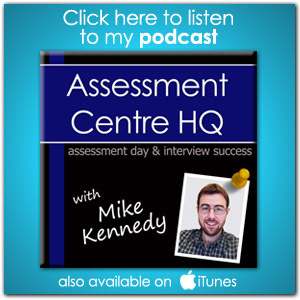 Let’s look at the basics of how to succeed in interview and assessment centre role-plays. 1) Read the brief carefully. Then read the brief carefully. This is absolutely crucial as any misconceptions or misunderstandings that you make as you rush to begin preparing can undermine all your subsequent efforts in this exercise. The above example role-plays are both quite simple, but for the role-plays used for more senior recruitment can be extremely demanding and complicated. Fully understand what is expected of you during this exercise. What role are you being asked to assume? Be absolutely clear on what you are being asked to do before you attempt it. 2) Prepare a list of open-ended questions. Why are these questions so valuable? They give you the most important thing you’re seeking in this exercise: more information and clarity. In most role-plays there’s often lots of relevant and important details that are NOT included in the brief. Some details are deliberately omitted as this ensures the role-play has headroom to develop and also allows the assessors to see if the candidate can think on their feet. ‘Bookends’ are pre-prepared opening and closing statements. Having a pre-planned opening statement (just a few sentences) will help you settle down and relax into the exercise and also ensure you make a confident first impression on the assessor. Similarly, a strong closing statement will wrap things up well and leave a favourable lasting impression of you. Spend a few moments during your prep time to create these. Try and commit them to memory, if they’re too long or complicated to remember then write them down in large writing (so you can read them at a glance). Bookends add a welcome element of professional sheen to your performance, so don’t overlook them! Having a clear plan before you begin the role-play exercise is essential but it’s equally as important that the activity unfolds as naturally as possible, so don’t formulate a rigid plan and expect things to pan out exactly as you have written on your piece(s) of paper. The conversation should be allowed to flow wherever it needs to go (this is one of the key indicators of a role-play that is going well). Why is flexibility so important? 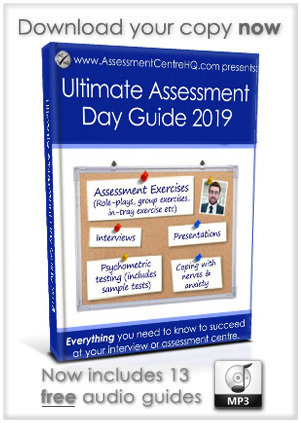 Because your rigid plan could go out of the window at a moment’s notice if the assessor drops a curve ball into the role-play exercise (which they can and often will do – especially if you’re doing well, just to see how you react). One of the assessors aims is to gauge how you react to unexpected circumstances, so keep things natural and relaxed and you will greatly increase your chances of reacting well. This may sound petty but it’s a very practical point: Don’t have an impenetrable mass of prep and notes all over your lap or a scribbled piece of A4 with notes covering every inch of space. Just have bullet-points written in a large size (ie, easy to read – even when you’re nervous). Nothing will improve your performance on the day more than familiarity with the exercise. 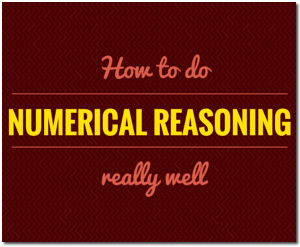 It will improve your competence and also help you stay relaxed. 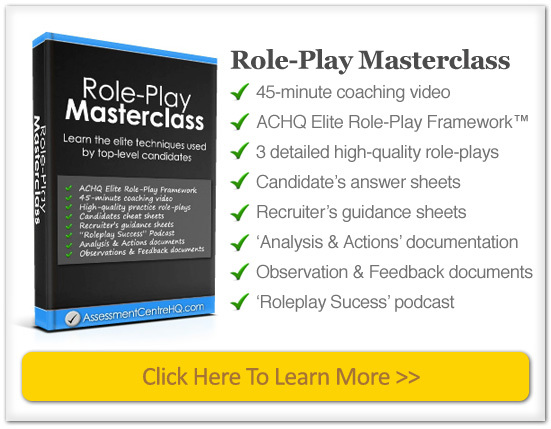 You can practise detailed role-plays and watch a 45-minute coaching video that walks you through your copy of the ACHQ Elite Role-Play Performance Framework™ in the Role-Play Masterclass. This is easy to say and difficult to do, but it’s vital to your success. Have a read of our article “How To Deal With Nerves & Anxiety” to learn some effective techniques to reduce any last minute panic. Remember you can get hold of a full suite of interview preparation tools here. 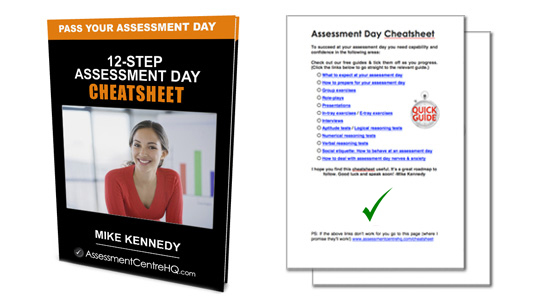 We hope you enjoyed this free guide? We’d love to hear your feedback on this article and also to learn how your role-play exercise goes, so please do get in touch and let us know. Thanks and good luck!